Today's guest blogger is Infusion Teaching Artist Ewa Sniatycka. 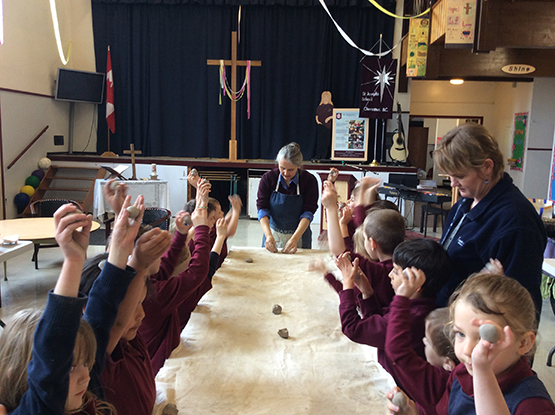 Over the past two years, she has been working with a team at St. Joseph’s School in Chemainus, BC — one of the six schools in the current Infusion Cohort program. Together, Ewa, educators and students have been experimenting with ideas and approaches about arts integration. The story below is an example of their creative explorations. This is the second installment about this project. To read the first part, click here. 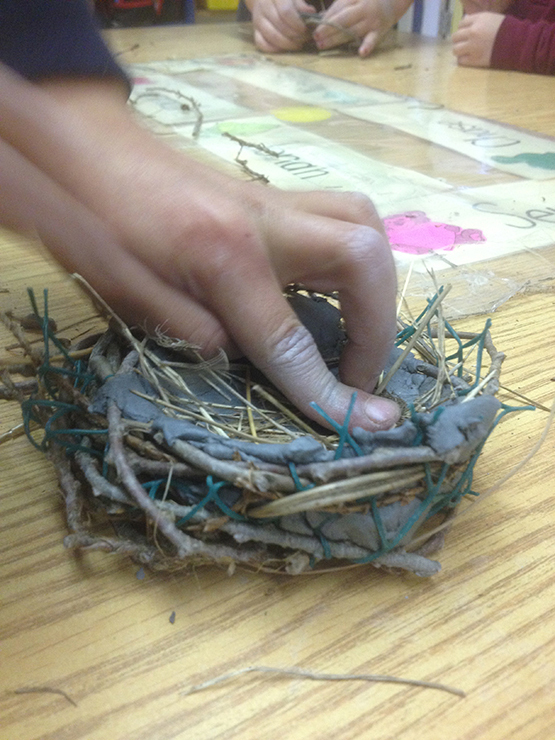 With the nests as a focus of free play, the collection of materials continued. The outdoor communal nests were an important site of activity and were regularly refurbished. Twig gathering also continued, as we needed to collect and presoak the sticks we would be using to build small nests of our own. We wove the twigs through an open mesh fabric. The process became a centre activity for the week, giving students more time to collect other construction materials and gain mastery of these materials- bending, weaving, curving, poking… Creating the structure of this home. 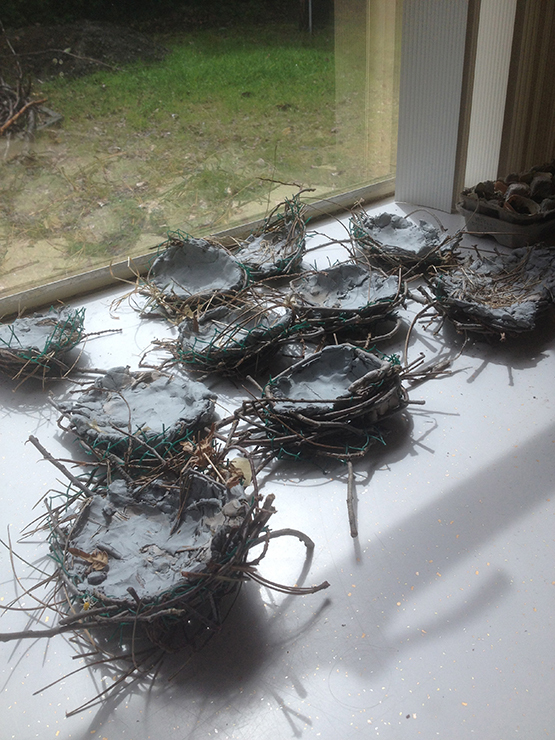 The following week we mudded our nests with small balls of clay, applied bit by bit to create the interior surface. Question: why is the inside of the nest smooth and the outside rough? 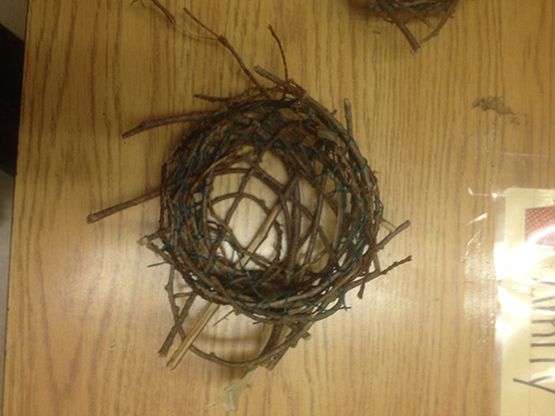 With the nests completed, students asked if we could build birds. Since birds are an important indicator of spring, we had discussed bird behavior, looked at birds in books and observed them outdoors. 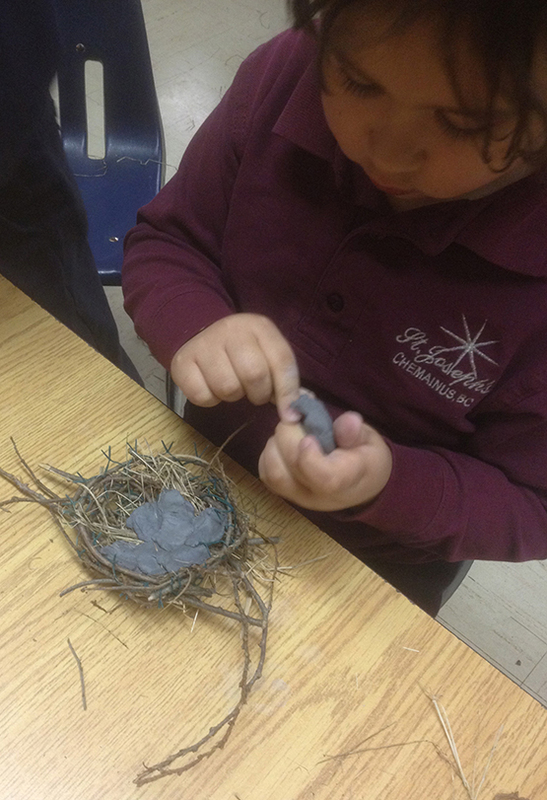 After discussing the basic parts of a bird in the classroom, we moved to the foyer of St. Joseph's School to build. The foyer is a large space that can be arranged in a variety of ways. It accommodates a diversity of activities, including assemblies and weekly masses, reading groups and arts-based explorations. I prefer to set the studio up in the foyer. It gives us a flexible space for our material explorations and invites the rest of the school community to see what we are up to. 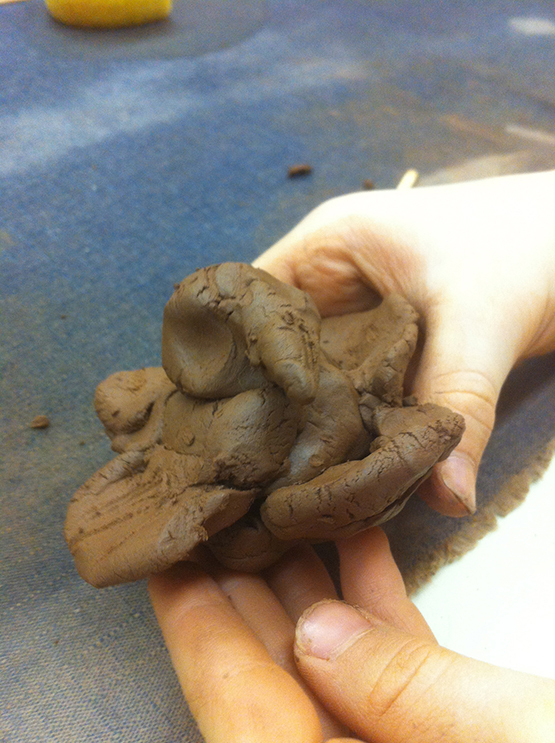 We began rolling a ball of clay then reducing it by half several times until we had 5 balls of various sizes. 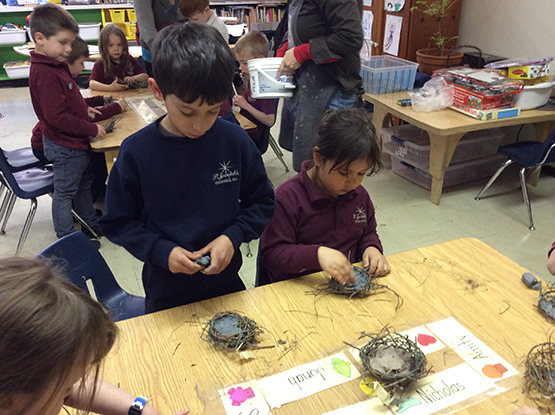 We organinzed our balls from biggest to smallest and began our birds. 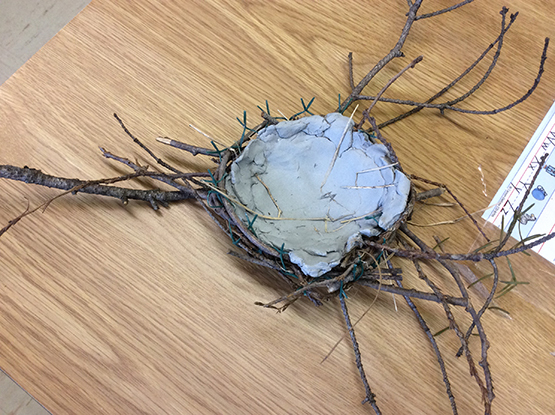 Children chose a ball for the body, looked at it closely, shaped it, added texture and pattern, and then set it down. The process was repeated for the head and wings. We dry fit each piece then scratched and slipped the points of attachment. The birds were bisque fired at cone 06 and then stained with tempra blocks. They went home in their nests around Mother's Day. Thanks to Ewa Sniatycka and Deb Cadwallader for the above photos.